This study reads Auden's poetry and plays through the shifts from modernism to postmodernism. 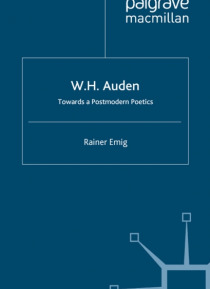 It analyses the experiments in Auden's writings for their engagement with crucial contemporary problems: that of the individual in relation to others, loved ones, community, society, but also transcendental truths. It shows that rather than providing firm answers, Auden's poetry emphasises the absence of … certainties. Yet far from becoming nihilistic, it generates hope, affection, and most importantly an ethical challenge of responsibility out of its discoveries.